Four accomplished chemists at The Sixth Form College, Solihull have earned awards at the prestigious RSC Chemistry Olympiad gaining silver, bronze and participation awards. 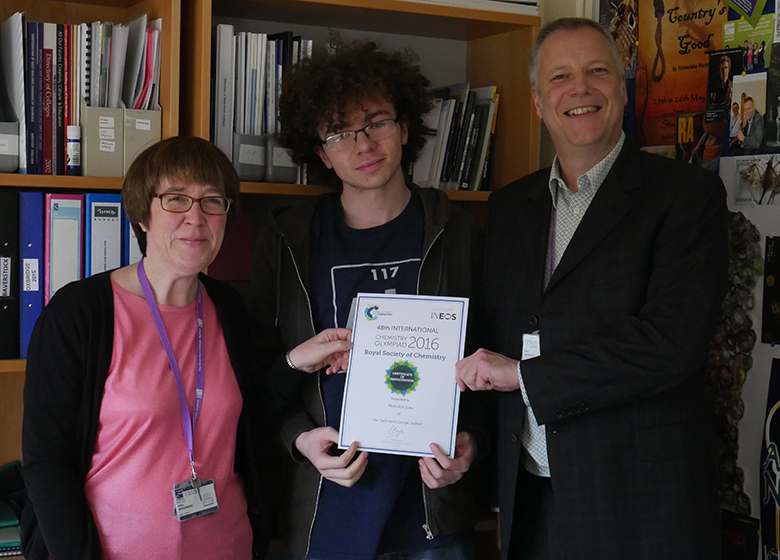 The students Myles Kofi Coke (pictured above with Curriculum Leader Hilary Woodward and Principal Paul Ashdown), James Mason, Cameron Parkinson and Akeeb Ahmed Saberi all volunteered to enter the international scheme administered in the UK by the Royal Society of Chemistry. They had to answer very challenging questions, testing their knowledge and grasp of advanced chemical concepts. The College’s top performer was James Mason, who won a Silver award. He has an offer of a place at the University of Oxford to study Mathematics. He is currently studying A levels in Mathematics, Further Maths, Chemistry and Physics. Fellow student Cameron Parkinson secured a Bronze award, while Myles Kofi Coke and Akeeb Ahmed Saberi received participation awards.